Sharwood’s is the leading Asian food brand in Britain. James Allen Sharwood (1859 – 1941) was born in Islington, London. He was named for his grandfather, a prosperous Fenchurch Street wholesale druggist. Sharwood’s mother was a Scottish schoolmistress, who instilled in him the importance of paying attention to details. Sharwood’s father was an excellent chemist, but a spoiled man. He spent extravagantly, and was sent to debtor’s prison after he was declared bankrupt in 1864. His marriage ended in divorce. J A Sharwood was to meet his father only once, in 1890, before he died in the workhouse in 1894. J A Sharwood attended the Heath Mount School in Hampstead, and then went on to work in the City of London. He initially worked in insurance, before working as a manager for a wine and spirits distributor. J A Sharwood established himself as a wholesale grocer on Carter Lane from 1888. Green Label mango chutney was introduced a year later. Sharwood was to prove himself intelligent, hard-working, and innovative. He had a keen interest in overseas travel and was fluent in French and German. 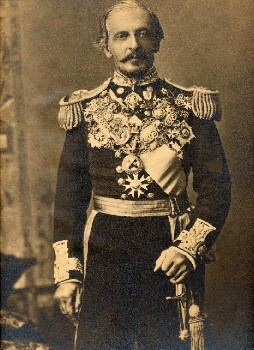 Sharwood was introduced by a family friend to Lord Dufferin (1826 – 1902), the Viceroy of India. Dufferin asked Sharwood to bring his French chef some supplies from Europe. Legend has it that the grateful chef recommended that Sharwood visit P Vencatachellum at No. 1 Popham’s Broadway in Madras. Vencatachellum made a famed curry powder, which blended stone-ground turmeric from Chittagong, coriander from Kerala, chillis from Orissa, and four secret ingredients. The mix impressed Sharwood, and he arranged to distribute “Vencat” curry powder in Britain from 1893. J A Sharwood was incorporated as a limited company with capital of £50,000 in 1899. A factory, the Offley Works, was established at Vauxhall. White Label Worcestershire Sauce was the main product by 1900. It was aged for five years. F A Bovill & Co of City Road, London, a preserve manufacturer, was acquired in 1900. J A Sharwood supplied the prestigious Cunard ocean liners with foodstuffs from 1902. Sharwood had retired by 1927 and settled in Cape Town, South Africa. J A Sharwood was advertising itself as “the largest dealers in Indian condiments in the world” by 1933. Sharwood died in 1941 and his effects in England were valued at £7,296. Cerebos, a British foods company, acquired J A Sharwood for £982,047 in 1962. The Offley Works were divested and production was relocated to Greatham, Hartlepool. Sharwood’s dominated the chutney market by the 1970s. Sharwood’s had a Royal Warrant from Queen Elizabeth II, to supply chutney and curry powder, by 1975. Sharwood’s sales doubled between 1989 and 1994, as the British market for Indian groceries grew. Sharwood’s held 74 percent of the mango chutney market by 1991. The Greatham factory was closed in 2001, and Sharwood’s production was relocated to Wythenshawe, Manchester. RHM was acquired by Premier Foods for £1.2 billion in 2007. The Wythenshawe factory was closed in 2009, and Sharwood’s production was relocated to Worksop, Nottinghamshire. According to food blogger Gareth Jones, the Sharwood archive was accidentally disposed of by a rookie marketer, and is no more.